The River City Radio Hour begins the new season in an open-air performance in downtown Waynesboro. The traditional August opener will be on the 500 block of West Main Street. 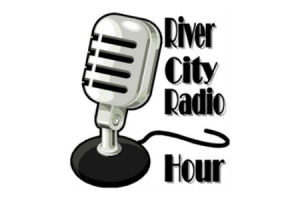 With the Wayne Theatre as a backdrop, the Friday, August 22 at 7:00pm Radio Hour will again bring music, comedy and drama to its audience. The evening will feature some of the Radio Hour’s favorite musicians. The Mojo Saturday Night Bluesman Kevin Chisnell will lead keyboard genius William Hayes and drummer extraordinaire J. T. Fauber in a celebration of 20th century American songwriting. Joining them will be the Valley’s songwriter/singer Brian Buchanan and The Dreaded Blues Lady, Lorie Strother. Both graced WTA’s Gateway stage and have been requested to return for the opener of the Radio Hour. From the blazing piano playing of Hayes, and the harmonic twists of Chisnell to the soaring blues of Strother and the traditional melodies of Buchanan, this special performance of the Radio Hour will appeal to the tastes of all music lovers. Also featured is the Radio Hour’s own First Lady of Comedy, marsha howard. Howard performed on the Radio Hour’s first performance in October of 2007. Since then she has scoured the comedy universe for her jokes. Beginning her next season with the long-running show, Howard will bring a new set of comic turns to her fans. Completing the evening will be selections from the Cultural Commission’s publication Waynesboro Writes, a collection of essays by students in Waynesboro’s four elementary schools. The booklet was published in June and distributed throughout the schools and the community. The individual pieces are a testament to the humor, creativity, and intellectual growth of the students from kindergarten through fifth grade. Performing the pieces will be Bill Martin, lorie strother and Clair Myers. There is also a rumor that a special announcement may be made at the close of the performance by the Wayne Theatre Alliance. Bets are that it will have to do with the restart and finish of the reconstruction of the Wayne Theatre. The performance is open to all. Some seats are available, but patrons are urged to bring their own chairs. The admission is ‘Pay-What-You Will’. The show starts at 7:00 pm on Friday, August 22, 2014.